Value Gear has been evolving from a "tents & tarps" stowage niche to the most interesting generic resin stowage maker in the hobby. Unless you purchase a vehicle-specific resin stowage set like those from Black Dog or Legend, no other manufacturer has the wide range of options for loading up your vehicle, regardless of army. After some discussion with Value Gear's Steve Munsell, the company has begun offering some exciting stowage specific to one of the most-popular (and ubiquitous) tanks of World War II: the trusty Sherman. No other tank served in as many armies or on as many fronts, including after World War II and in a variety of variants. So it's welcome news that Value Gear offers six different sets of Sherman engine deck stowage. Inside the usual Value Gear Ziploc baggie stapled inside a folded card are five gray resin pieces. One criticism of Value Gear stowage sets has been that it was challenging to combine various items like tents, tarps and crates for piling up on a vehicle. Soldiers are eminently practical, and tanks, trucks and anything else that moves become moving vans as much as fighting vehicles. Photos from WW2 show Shermans often piled high with gear, sometimes using improvised rear decks. 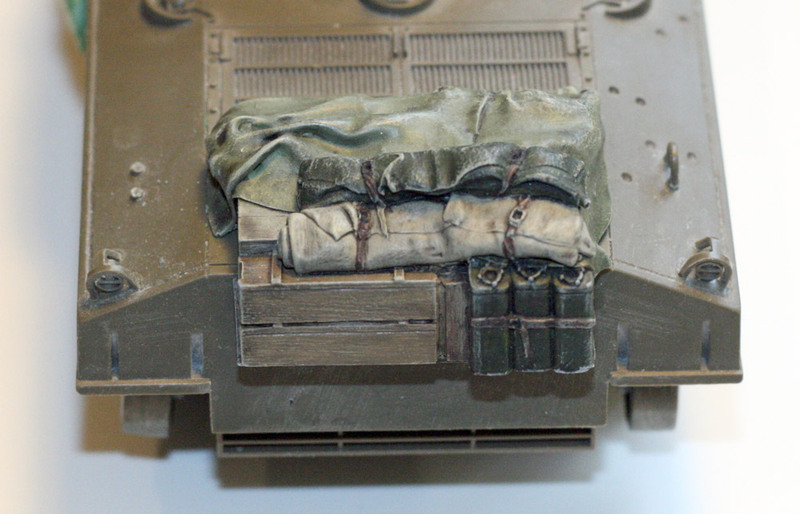 Value Gear has listened to these requests for stowage that would fit atop a vehicle like the Sherman, and this and the other Sherman sets give modelers a variety of solutions to their "piling up" desires. Four of the six sets have at least some of the gear combined onto a stowage rack that slips over the rear deck of the tank, while two of the sets have no rack and invite the modeler to make his or her own combination. While many resin sets require careful degreasing, Value Gear products use no mold release agent, so clean-up is simple. I still wash even these items in a bath of Bleche Wite tire cleaner or Windex before painting just to be on the safe side. This particular set of gear has several crates, three jerry cans and some tarps over a mound of unidentified gear, as well as two Musette bags from Value Gear's "USA Bags & Packs" sets. The combination allows for a very credible way to deck out a Sherman in any theater of operations. Once again, Value Gear has addressed the needs of modelers with products that are both a superior value for money, as well as exhibiting the sharp casting and attention to detail the company has conditioned us to expect. Highs: Value Gear's usual crisp casting, imaginative items and good value for money. Verdict: Highly recommended for Sherman builders in any theater or even post-WW2. I have bought and used quite a bit of this 1/35 "V.G." stuff and for the money,it is very good value with good quality of casting and sharp details on all the sets I have bought.